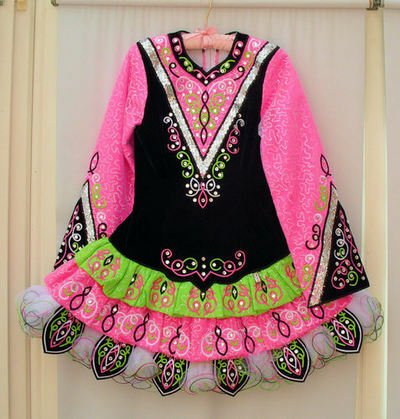 Up-to-date Rah-Rah dress in excellent condition, hardly worn and less than a year old. The bodice is black velvet with a cotton lining for comfort. 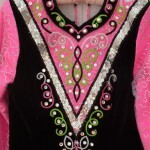 Sleeves are pink twinkle with an overlay of small sliver sequins. The skirt tiers consist of lime green twinkle, pink twinkle and black velvet petals with layered tulle inbetween, under the skirt it is lined in pink. 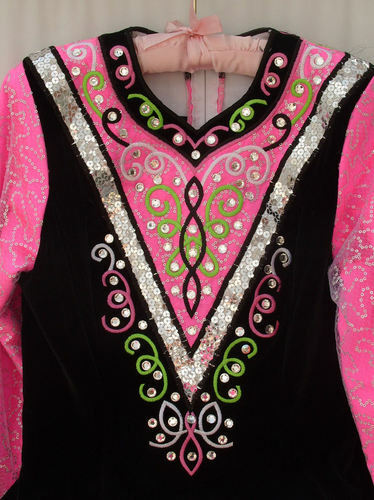 There is a rhinestone number clip attached at the front of the dress. 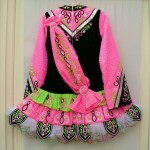 The cape/sash is a slim style with a rhinestone brooch at the top and bottom. Dress comes complete with knickers and headdress. There is a good 1.5″-2″ let out. Asking Price: Â£750. Shipping costs not included. Sale is final.